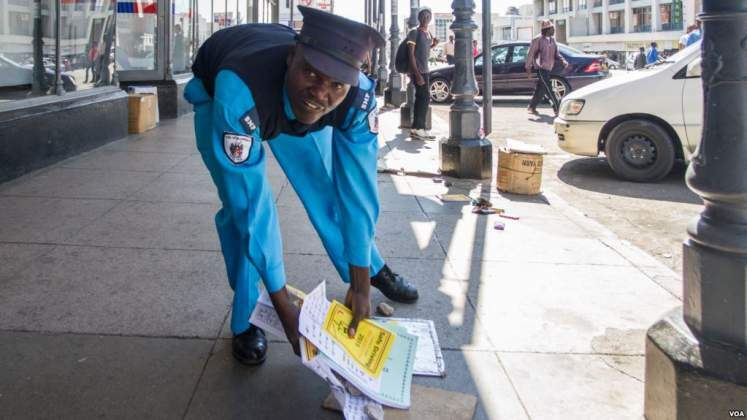 POLICE in Bulawayo have fined 289 illegal vendors in a blitz aimed at bringing sanity to the city. BCC senior public relations officer, Mrs Nesisa Mpofu, said an operation against illegal vending activities in the city started on October 11 and would continue until normalcy returns to the city's streets. She said the illegal vendors were each fined $5 by the police. Mrs Mpofu also said 159 push carts were also impounded and their owners were fined $10 each. "The City of Bulawayo has been experiencing an upsurge in illegal vendors especially in the Central Business District in contravention of the Hawkers and Street vendors By-Laws (1976) and council vending policy. "These unauthorised informal traders are disrupting normal pedestrian movement and unfairly competing with licensed traders. Furthermore, they sell unauthorised goods and endanger public health by selling un-inspected food. The activities have become unsightly and have resulted in congestion, littering and disorder in the city," she said. Mrs Mpofu said the city council is carrying out a blitz against illegal vending activities and the operation is aimed at bringing sanity back to the city. She said all vendors with bays are required to regularise their activities. "It is unfortunate that a number of informal traders had not renewed their licences for 2017 and had abandoned their bays. 289 illegal vendors were arrested between October 11 and October 31 and their wares (these included perishables and clothing) were handed over to Zimbabwe Republic Police licensing inspectorate for disposal," she said. Mrs Mpofu said those who wish to acquire vending bays must visit council offices. "In view of the above, the public is advised that those who wish to trade as informal traders in the city of Bulawayo should approach the Housing and Community Services Dugmore Vending Offices, located along Basch Street and 6th Avenue, for registration and licensing. The city council has warned illegal vendors to desist from trading at undesignated areas as council will ensure that the law takes its course," she said. "Registered informal traders who have abandoned their bays and or are not paying the required council fees are advised to return to their bays and regularise their operations. Failure to register with council will result in the reallocation of the bays to other deserving members of the community. Only one bay is allocated per trader on a first come first served basis. All informal traders are also required to keep the city clean by ensuring that their trading places are cleaned after trading hours." She said annual licence fees are pegged at $23 including Value Added Tax and there are monthly rental fees for space pegged at $5 for western areas and an average of $11,50 in the CBD. "Applicants are also required to bring a copy of their National Identity, processed finger print forms and two passport size photos. "Fruits and vegetables traders have additional requirements which include them having to pay $13 at Khami Clinic for pre-examination for contagious diseases. They are also given lessons on how to handle such food for the public," Mrs Mpofu said. "Sanity has been restored in full at Site 5 North (Outside MaDlodlo Beer garden) and the Market Site has also been cleared of illegal vendors. Work is in progress to clear the area around Edgars along Herbert Chitepo Street and Tredgold Magistrates' Courts." Addressing members of the Zanu-PF Youth League at the party's headquarters in Harare last month, President Mugabe deplored the vendor menace. He said vendors should be moved to designated points to allow for the free flow of human and vehicular traffic in the CBD.